Cyclone Rake Blog: How to compost? The Cyclone Rake blog is a place to find great information and inspiration to get the most joy and use out of your property. Each month we talk about great topics including lawn care, garden projects, and ways to save time and energy with solutions that will make caring for your property easy. Composting is good for your soil. Making compost from grass clippings, leaves, kitchen waste and other non-fatty organic matter turns raw organic matter into fluffy, nutrient-fortified, soil improving compost. Compost is also good for the soil beyond your backyard, recycling instead of disposing yard and kitchen wastes. Like any good gardening practice, the key to making great compost in your backyard is to understand some of the science behind the process and practically apply that science in your own situation. As it turns out, the science behind heating up a compost pile is, to put it one way, very cool. 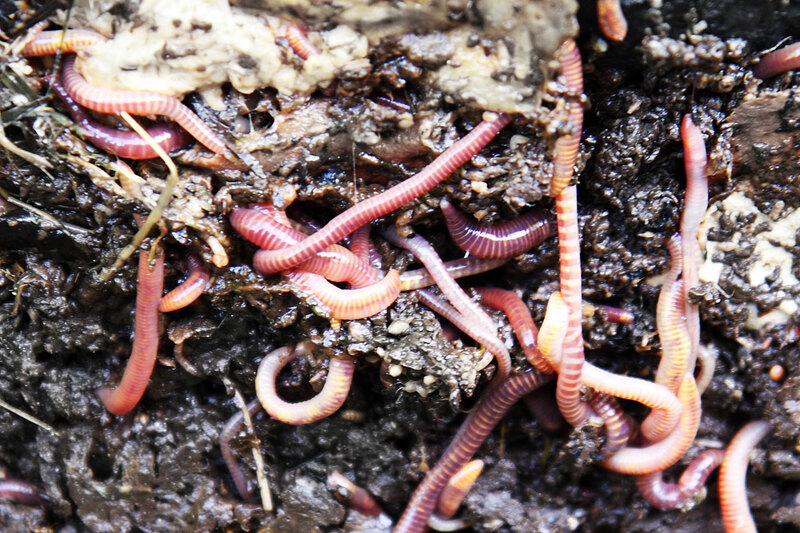 Many different microorganisms – not to mention bigger critters like earthworms – will decompose the wastes in your compost pile. But your compost pile’s best friends are aerobic bacteria. It would take 25,000 of them laid end-to-end on a rule to make one inch. Aerobic bacteria are the most efficient at breaking down organic wastes into original elemental components. For more about them, and an easy-to-read description of composting science, check out an excellent explanation from the University of Illinois at http://web.extension.illinois.edu/homecompost/science.cfm). Aerobic bacteria use nitrogen and carbon while they break down organic matter. Your goal is to create a great environment in your compost pile for aerobes. Follow these “good composting practices” for some sure success. Compost plant matter like leaves, grass clippings, yard and garden waste. Compost kitchen waste from fruits and vegetables and eggshells. Don’t compost fatty wastes (meats, oils), ashes or pet droppings. Some homeowners, with access to manure from disease-free livestock and poultry, may choose to add layers of nitrogen-rich manure or barn muck. 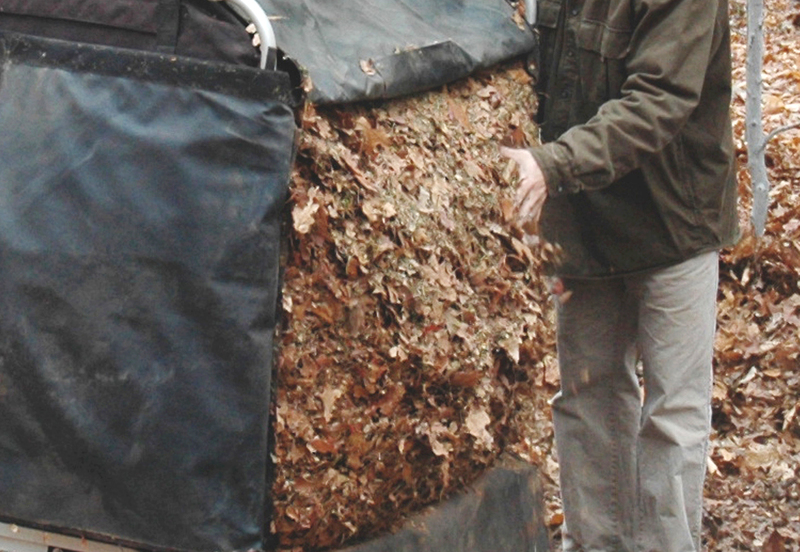 Build your compost pile with about two-thirds “browns” (leaves, etc.) 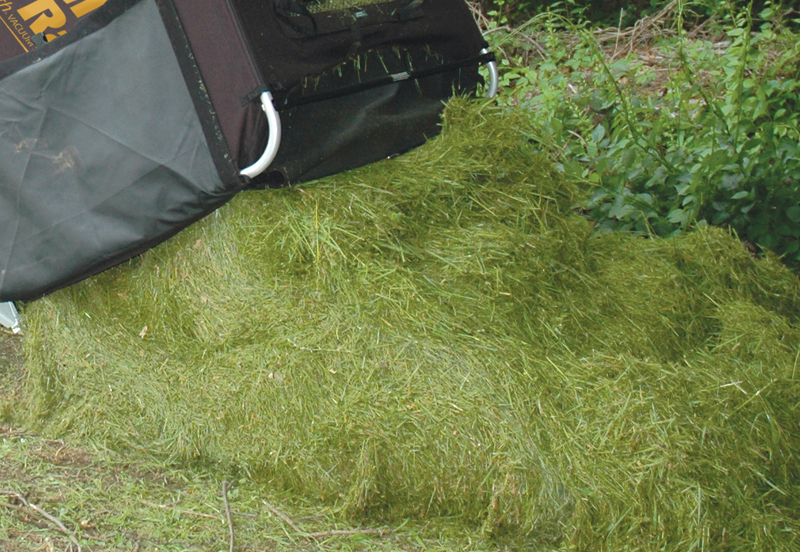 and one-third “green” (grass clippings, fruit and vegetable waste). This ratio promotes the 25:1 carbon-nitrogen ratio preferred by aerobic bacteria. Your aerobes will enjoy it if your raw compost materials are properly prepared. Make sure to use the mulched leaves and grass clippings you have collected with your Cyclone Rake! The chopped up leaves have more surface area for the microbes to feast. Layer the materials, based on the size of your pile, alternating browns and greens. A compost pile with the right brown-green ratio is low-maintenance, so long as two things are provided: air and water. Aerobic bacteria do best with plenty of oxygen, and they utilize organic materials dissolved in water. A 40 to 60 percent moisture content is ideal; the more “browns” in a pile (especially wood chips and straw mulch), the wetter the pile should be. Turning the pile keeps the pile from compacting. Some composters like to install a PVC pipe, with holes drilled in it, in the center of the compost pile. Others like to use a cylinder of chicken wire or even a bundle of sticks to help air circulation. Finally, a word about temperature. As the microorganisms do their thing, temperatures rise in the compost pile. You can pay a lot of attention to your compost pile’s temperature, even purchasing a compost thermometer! A “hotter” pile will decompose faster, but this is not too much of a worry in the summer months. If you have the right mix to begin with, and regularly turn the pile, the temperature will stay in the range preferred by the most productive aerobes. Once the compost is finished, it will be fluffy and black. Add it to your beds and gardens, turning it into the soil. Keep some of the “finished” compost in your pile to help jumpstart the next batch. If you are interested and want more information about the science behind composting, be sure to check out resources available from your local Extension office or the link above from the University of Illinois. Labels: aerobic bacteria, best practices for composting, How to compost?, science of composting, What to compost? Copyright © Woodland Power Products, Inc. All rights reserved. Picture Window theme. Theme images by wingmar. Powered by Blogger.